Revolver “Cherubin”, with central percussion, six shots, calibre 380. Round barrel and with sides, engraved with the thunder. Iron carcass covered with each with dimensions of copper nickel zinc alloy plates, engraved “Sistema - L Cherubin Padova” on a face and, on the other face, “Brevettato E Premiato all' Esposizione 1881”. Stick with plates in burr walnut, folding trigger. The ignition being done all with the back, a shield of cut out and engraved copper nickel zinc alloy palm makes it possible to protect the hand from possible projections. The lever located under the barrel, when it’s in a hurry, makes it possible to arm by pushing back the hammer backwards. 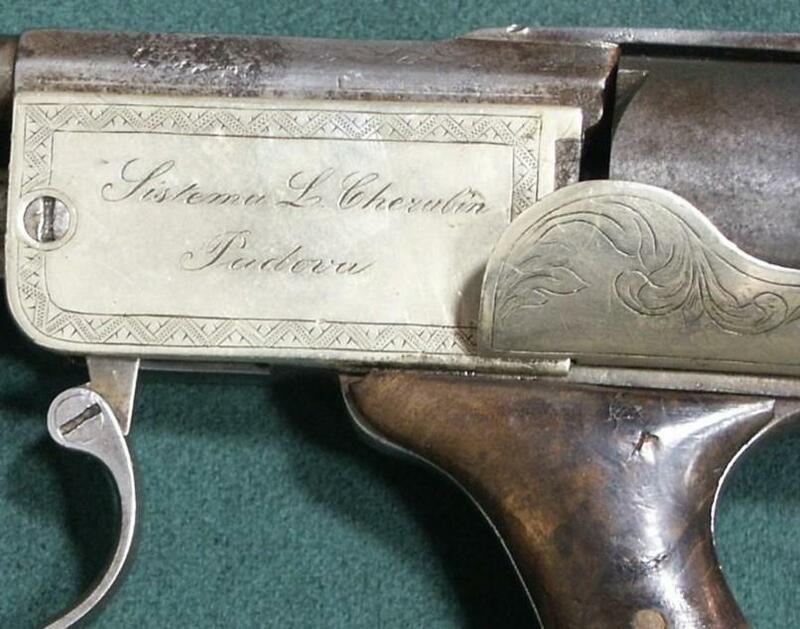 The signor CHERUBIN Luigi, born in Vicenza and domiciled in Padova, deposits in 1880 an patent application for a revolver with central fire, granted on February 23, 1881, for one year from December 31, 1880. It obtained with the exposure of Milan in 1881 a honourable mention “menzione onorevole”. This weapon comes from the collection Manuel Huerta. Thanks to Alberto for his assistance.